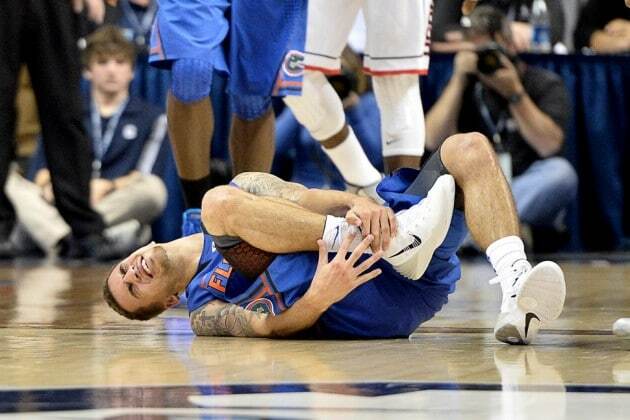 A sprained ankle is the #1 most common injury in basketball. Actually, it is the #1 most common sports related injury, period (25,000 a day or 9,000,000 a year). I have played basketball for many, many years and that means I have sprained my ankle many, many times. I know from personal experience how painful and frustrating an injury it is from the long healing period to the weak, unstable ankles afterward. In fact, I think it would be fair to say that I created the H.E.M. Ankle Rehab System, because I played so much basketball and therefore sprained my ankles so many times and got completely fed up with rest and ice as a healing tool. I dealt with slow healing times and eventually got to the point where I wore ankle braces on both feet, because my ankles had gotten so weak and unstable. Without them, I felt like my ankles would sprain at the smallest provocation. In fact, many times, I sprained my ankles just by running and turning on the court, when no one else was even near me. That shows just how weak they had gotten over time. Eventually, I got to the point where my game had slowed down so much and I was in constant pain that I thought of giving up basketball altogether. Fortunately, I have an excellent background and knowledge of the body and had been training professionally for a number of years, so I applied my expertise to ankle sprains. I did a lot of research to see if there was a better way to heal a sprained ankle besides R.I.C.E. (rest, ice compression, elevation), because at that point, that was all I knew. Within a few months, it became readily apparent that rest and ice were completely out-dated and ineffective, but no one had any alternatives. 1) You should NOT ice a sprained ankle… Icing your sprain will help with short term pain relief, but it will slow down and inhibit the healing process immensely. Please, click the link to read an entire article based off recent research that goes into more depth. In short, ice stops lymphatic drainage and can reverse the flow of waste back into the injured area (that’s bad)! In addition, ice stops the flow of powerful immune cells called macrophages into your ankle, which is necessary for repairing muscle and removing waste from the ankle (that’s really bad). Instead of ice, you want to improve healthy blood flow (step 1 of H.E.M.) and eliminate swelling (step 2 of H.E.M.). Since, ice inhibits and stops these important healing processes, you should avoid it at all costs. 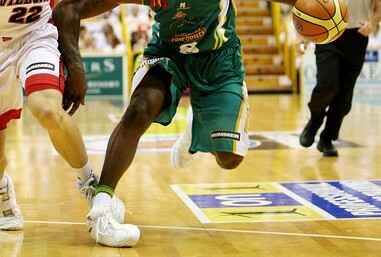 2) You should NOT wear ankle braces – I see so many people playing basketball and wearing ankle braces, wraps or tape. Again, click on the link to read the full article but in short, the ankles are mobile joints. You want them to be healthy, strong and mobile. You do NOT want to immobilize them with braces. If you do, the next joint up is the knee and that is a stable joint. But, if you immobilize the ankle joint and then go play basketball, when you move laterally (side to side) or cut to the basket, or make any sudden movements, your ankle won’t be able to move so your knee might… and that would be very bad, since it is not meant to move more than a few degrees without tearing. That is one of the main reasons we see that 70% of ACL and MCL tears in the knee are non-contact injuries. So, instead of strapping on an ankle brace, take a little time to rehab your ankle properly. You will be able to move better and reduce the risk of sprained ankles AND knee injuries. 3) Improve basketball performance with ankle rehab – If you want to be faster, jump higher and increase agility on the basketball court, you need to strengthen your calves and ankles. These muscles are what propel your movement on the court. If they are weak, unstable and stiff, you will be slow and at a constant risk of re-injury. And, stiff, weak, unstable ankles can change how you move which can also cause knee, hip and low back pain/injury. But, if you work on your ankles and improve strength, stability and healthy range of motion, it can significantly increase your overall athletic performance and that is something you will see and feel on the basketball court. 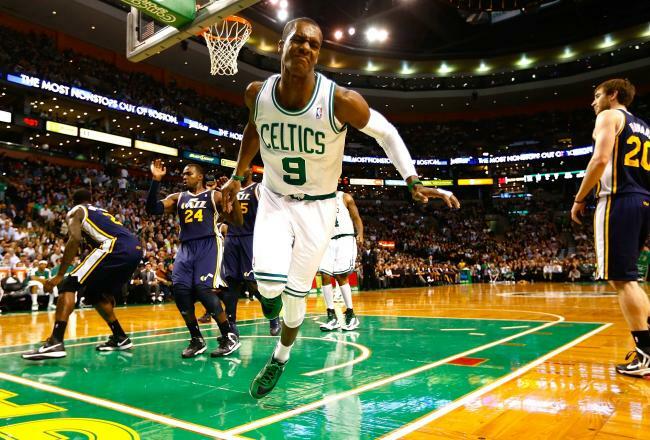 You will be able to jump higher, move laterally with greater speed and significantly improve your overall quickness. 4) Reduced risk of sprained ankles WITHOUT ankle braces, wraps or tape – If you want to be able to play basketball without the constant fear of a sprained ankle, start doing rehab on your ankles right now. Every time they get injured, your ankles get weaker and more unstable and that increases your risk of re-injury. But, if the ankles are strong, stable and have a healthy range of motion, they will be at a far LOWER risk of sprains. And you won’t need those crutches that make your ankles weaker (braces). Most people have explained that it feels like wearing a brace on your ankles without actually having one… that’s how strong and stable your ankles will feel, but WITHOUT the loss of healthy range of motion. 5) Basketball shoes will NOT protect your ankles – I see a lot of people wearing high top basketball shoes as if that is some kind of protection from a sprained ankle… it is NOT. You can either rehab your ankles naturally or use ankle braces, wraps, tape, etc… The shoe provides so little protection, it is not worth the added weight and discomfort. I personally wear low top shoes and every body asks why when I play ball. Well, my ankles are stronger and at a lower risk of sprains than someone who wears an ankle brace, so why should I wear uncomfortable shoes that do not protect my ankles? I went from a guy who sprained his ankles all the time and wore ankle braces to someone who wears no ankle braces and low top Nike Free shoes to play basketball. I do not sprain my ankles anymore and they are stronger and more stable now than they were ten years ago. I have worked with many professional athletes and celebrities and I have been featured on ABC News as an expert multiple times, so I cannot afford to put my name on something that is not 100% legit. But, the real proof is in the hundreds of thousands of people that H.E.M. Ankle Rehab has helped over the years. I am so proud to have helped so many different people from so many different walks of life quickly and effective heal a sprained ankle and lower their risk of future injury. I guess I’m lucky I sprained my ankles for all those years playing basketball, because if I hadn’t, there would be no HEM Ankle Rehab. Whether you have a newly sprained ankle, weak ankles or an old, stubborn injury, H.E.M. 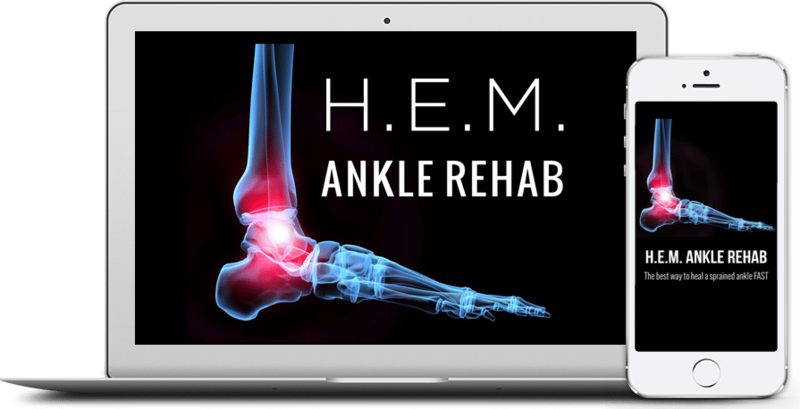 Ankle Rehab will help you out tremendously. There’s a 30 day money back guarantee if you are unhappy for any reason, so I hope you’ll give it a try. And then you can get back to balling without the pain or fear of an ankle injury. Instead, you can focus on that jump shot!